Now that the slow, rolling train wreck that was this year’s Academy Awards is finally over, the Governors or whatever they call themselves must be breathing a heavy sigh of relief. Profiles in courage they were not. First, to address the show’s declining viewership, they tried to introduce a new “Popular Film” category. They backed down when social media exploded with derision. Next, they picked popular comedic actor Kevin Hart to host. The social media warriors immediately dug up dirt to prove that he was a normal human being who makes mistakes, and he was gone. 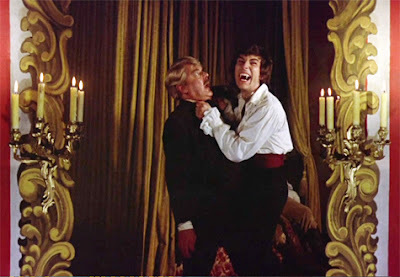 Finally, adding insult to injury, they proposed offloading the cinematography and editing awards from the live show to a few seconds of tape, and once again they backed down after a tidal wave of indignation (rightly so, of course). 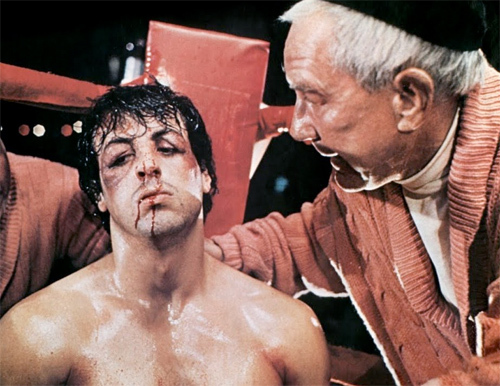 "I don't think I can last another round -- those tweets are so mean!" I do feel sorry for the Academy. It’s an impossible task to try to please everyone -- fans, critics, industry types, the show’s advertisers, etc. IMHO, their biggest challenge is the growing chasm between the big budget, big effects, big box office movies that are loved the world over, and the smaller, character-driven dramas that dominate the major awards but that relatively few people see. Lumping something like Roma or Green Book with Black Panther in one Best Picture category is like comparing apples and elephants. Ultimately, I think the Best Picture category needs to diversify, but instead of “Popular” (which focuses too much on marketing and box office), they should go in the direction of the Golden Globes, with possibly three best pictures in such major genres as Action, Drama, and Comedy/Musical. Obviously, this is a collective, not an individual’s award. A veritable army of highly talented artists and technicians, backed by big bucks, labors months on end to bring fantasy worlds and action heroics to life. Before CGI helped sci-fi and fantasy action dominate the movie market, filmmakers with ambitious visions still had quite an array of tools on hand, from mechanical props and foam rubber appliances, to stop motion photography, mattes and optical printers. But they could scarcely imagine how computers would transform the business to the point that anything someone could dream up could be vividly and realistically depicted on the screen. Or how much money would flow into sci-fi and comic book adaptations -- genres that in their time were often disreputable and threadbare. Of course, this blog specializes in just those disreputable and threadbare movies of old that against all odds, still have a fan base to this very day. 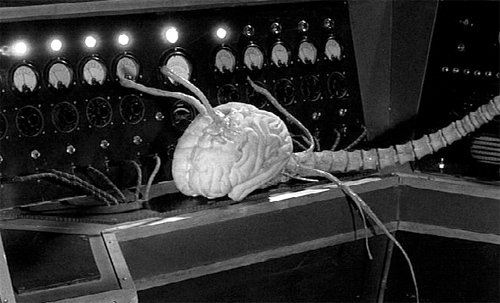 In the spirit of the recently concluded film awards season, I’d like to honor the special effects maestros who didn’t have wads of cash or supercomputers to work with, but still managed to create some of the more memorably weird creatures of ‘50s sci-fi with the equivalent of chewing gum and baling wire (and lots of foam rubber). Paul Blaisdell was the premier wizard of low budget effects in the ‘50s, responsible for some of the weirdest, most imaginative monsters of the pre-CGI era. 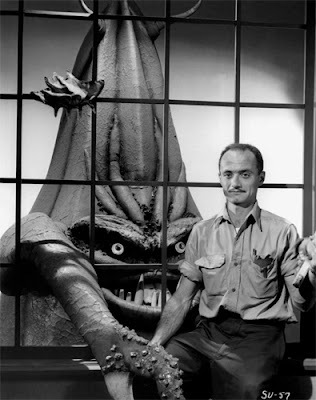 He was a sort of one man effects shop, designing and fashioning props, mechanical creatures and monster suits, and then operating and/or wearing them on camera. 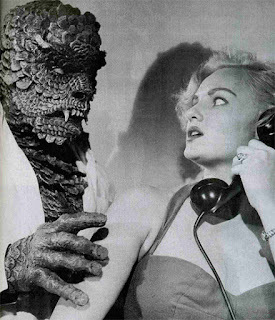 He worked so cheaply and reliably that he was the go to monster maker for Roger Corman and American International Pictures, creating such unforgettable menaces as Marty the Mutant from Day the World Ended (1955) and the surrealistic She-Creature (1956). "I wonder if I still have that recipe for Venusian vegetable soup?" Perhaps his most outlandish creation is the titular monster of It Conquered the World, which he affectionately dubbed “Beulah.” The film is about a Venusian creature that establishes radio contact with an earth scientist (Lee Van Cleef), who, believing the advanced alien intends to bring peace and prosperity to the world, unwittingly helps it to establish mind control over key government people in order to subjugate the planet. The result looks like nothing else from ‘50s sci-fi. 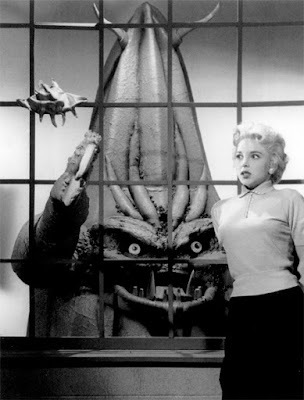 Purportedly, when actress Beverly Garland first set eyes on the creature, she responded with a sarcastic “That conquered the world? !” The press also got in on the action, referring to it as the “cucumber” from space. However, “Beulah” got its revenge on the set. 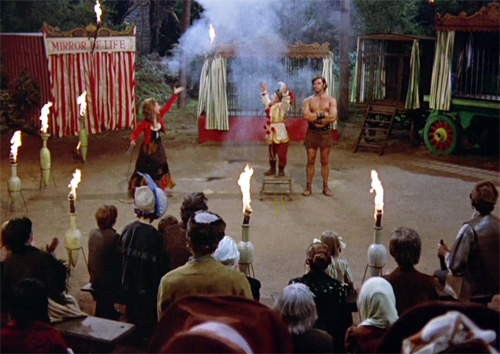 Beulah is truly a one-of-a-kind monster next to all the rubber-suited humanoids and giant insects and dinosaurs that rampaged across drive-in screens in the '50s. After you get over your initial instinct to snicker, her distinctive WTF! ugliness commands attention. 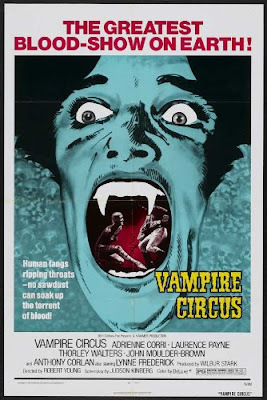 She reputedly was director Roger Corman’s favorite of all of Blaisdell’s creations. This category would not be complete without a stop-motion animated monster, and Fiend Without a Face delivers a ghastly gaggle of repulsive animated creatures that make your skin crawl even as another part of your brain is marveling at how ridiculous they are. At a military nuclear research facility in Canada, Major Cummings (Marshall Thompson) has his hands full when several local townspeople die under mysterious circumstances and people start blaming the facility. At the same time, the facility experiences inexplicable power drains on the nuclear reactor. It seems a local scientist is hijacking the facility’s power in order to conduct experiments on turning thought into material form. What could go wrong? The brain creatures dial up the suspense in Fiend Without a Face. The beauty of the brain creatures is that when you first see them -- naked brains with insect-like antennae and spinal cord tails -- you want to guffaw. But when they wrap their tails around the necks of the horrified victims, they suddenly aren’t so ridiculous. 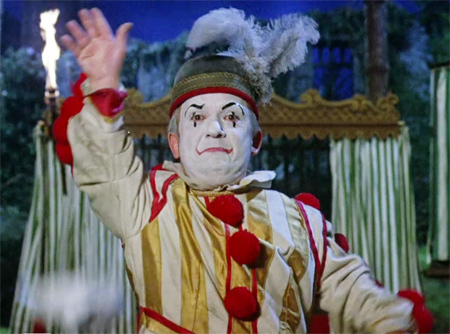 This alone makes Fiend Without a Face one of the more memorable minor classics of the ‘50s. Although The Hideous Sun Demon had an ultra-low budget somewhat south of $50,000, it boasts one of the coolest (and yes, most hideous) creature masks in a decade that swarmed with all manner of foam rubber horrors. "Do you want pepperoni or mushrooms on your pizza?" The Sun Demon was born when B actor extraordinaire Robert Clarke, noting the box office success of the cheap-as-dirt The Astounding She-Monster (1957) he had recently starred in, decided that he could do just as well producing his own monster movie. He had the idea to do a sci-fi variant on the classic Jekyll and Hyde story, but instead of a serum, it’s accidental exposure to radiation that turns the mild mannered scientist into a ravening monster. Another story kicker is that as a result of chromosomal damage to his body, the protagonist only changes into a monster when exposed to the sun. Although overall the film looks as cheap as its budget and the acting is variable at best, the hideous, reptilian Sun Demon looks way, way cooler and scarier than its $500 cost would suggest. 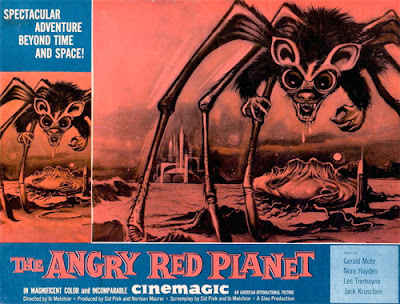 When I first saw Angry Red Planet at about the age of 9 or 10, I was mesmerized by it. It had everything a sci-fi fan could want: a needle-nosed spaceship, wisecracking astronauts, a beautiful red-haired scientist-astronaut (Nora Hayden), a weird, glowing red Martian landscape (thanks to Cinemagic! ), and monsters galore. There was a gelatinous blob with a huge rotating eye, a three-eyed Martian, and best of all, the unique Rat-Bat-Spider-Crab that towered over the terrified space travelers. It’s a good thing that the crew found a way to make it all work within the limited budget, as it’s the most memorable scene in the film. And befitting his status as the lead attraction, Rat-Bat-Spidey is featured prominently on most versions of the film’s poster. Like the Hideous Sun Demon, this nomination is all about the suit. 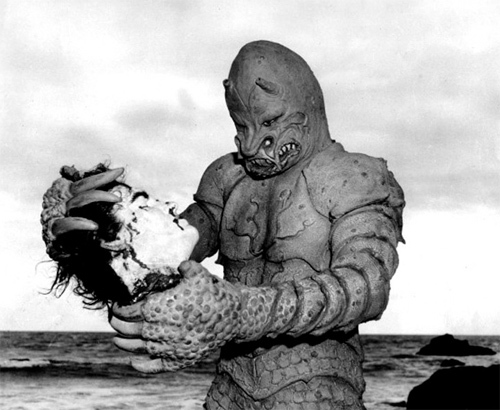 While Robert Clarke found Jack Kevan to be a little too pricey for his production, the producers of The Monster of Piedras Blancas scored a coup in enlisting Kevan to work up their creature suit. Kevan had not only been involved in helping to create The Creature from the Black Lagoon (1954), he also lent his talents to such sci-fi classics as It Came from Outer Space (1953) and The Incredible Shrinking Man (1957). of infinite jest, of most excellent fancy..."
The Piedras Blancas creature was partially built, Frankenstein-like, from other body parts. The Metaluna Mutant of This Island Earth (1955) contributed his feet and torso, and the huge claws came from The Mole People (1956). 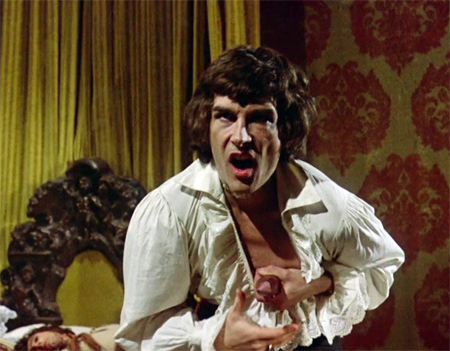 Even with borrowed body parts, the monster has its own distinctive, gruesome look. The producers, perhaps feeling that a cool suit by itself wouldn’t bring audiences flocking to the drive-in, upped the gore factor considerably -- the monster likes nothing better than to decapitate its meals before eating them. Again, like the Hideous Sun Demon, the film suffers from cheap production values, but in the end is redeemed by an ultra-cool member of the Gill-Man family. "I only have eyes for you." Paul Blaisdell with his creation. Paul Blaisdell for his freakish, yet endearing creation Beulah. She is both an imaginative suit and a mechanical contrivance. Some may disparage Beulah for her cartoonish appearance, but she is the result of Blaisdell’s thoughtfulness about what sort of a creature might evolve on a planet with extreme atmospheric pressures and gravity. There’s no record that Ib ever saw Beulah, but I think he would have approved.